Add a stately and colorful shelter to your bird garden with the Heartwood Grey Bluebird Manor with Blue Door. Turning your outdoor space into a bluebird sanctuary helps these wonderful birds thrive, and the classic design of this house adds an elegant look to your setting. Its pitched roof and square shape create a classic shelter, while the grey, painted exterior adds an aged look. The bright blue front panel captures attention, enhancing nearby blooms. This all cypress body keeps the roost well insulated for the bluebirds, and the 1.5" diameter entry on the front extension provides them with easy access. Shingles and copper flashing on the roof further the classic look, and a slight overhang helps the interior remain dry. Ventilation slots beneath the roof prevent nestlings from overheating, and a drainage gap at the base allows excess water to escape. The hinged, blue front panel opens easily for nest checks, and a metal latch keeps it closed for the safety of your feathered friends. A mounting tab extends from the back of the home, for placement against a post or fence in moments, and the cypress construction ensures a beautiful and durable piece. 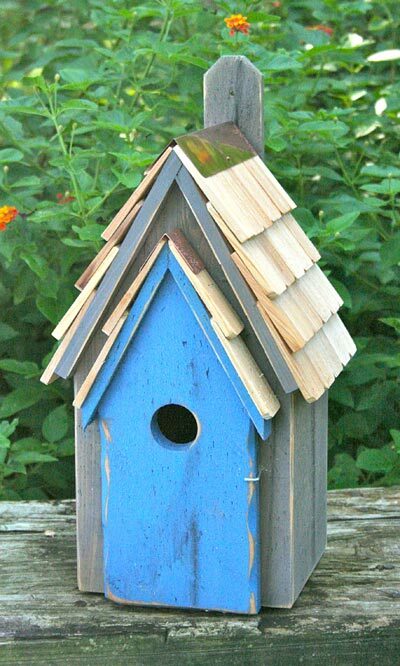 Help bluebirds find a safe and lovely roosting spot by placing this Grey Bluebird Manor with Blue Door in your garden. Made in the USA.